What are Facts about the Rhubarb Plant? As far as Rhubarb Plant Facts are concerned, it appears that many people are not very familiar with the tart vegetable called rhubarb. 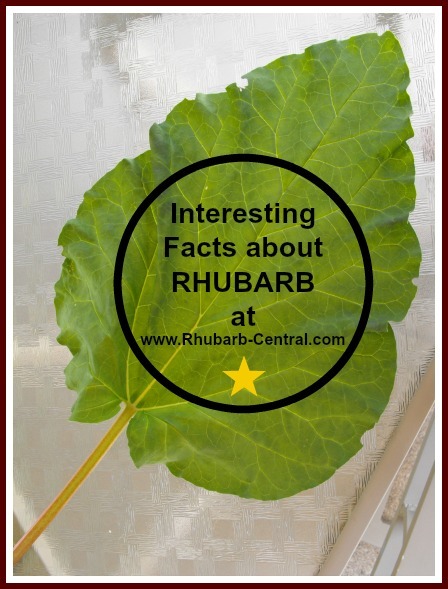 The scientific name for rhubarb is Rheum rhabarbarum. Unlike most other vegetables, even those who grow this most versatile of all veggies(! ), often wonder about the facts surrounding the "pie plant". Here (below) are facts and information about this garden vegetable that you may both surprising and interesting! Another name for the Rhubarb Plant is "Pie Plant". No wonder the word "rhubarb" seems to be synonymous with "pie"! Rhubarb is a vegetable not a fruit. It is commonly used as a fruit in sauces, pies, cookies, bars, cakes, and famous dessert crisps and crumbles! are grouped in large, compound leafy inflorescences. One of the historical rhubarb plant facts, is that Ben Franklin is credited with being one of the first people to send rhubarb seeds to the American Colonies. See Also: What Does Rhubarb Taste Like? Rhubarb is low in calories, low in fat, cholesterol free, and is high in fibre, providing approximately 5 grams of fibre per cup of cooked rhubarb. One of the important rhubarb plant facts to remember is that Rhubarb leaves are toxic (poisonous). They contain oxalic acid. Some parts of the rhubarb plant have medicinal uses. In previous centuries, rhubarb was cultivated almost sole for its medicinal uses. Fresh, tender rhubarb stalks can be eaten raw, but they have a tart flavour. If rhubarb is consumed raw, it is usually dipped in sugar. Now that's a rhubarb plant fact that you might want to try for yourself! Rhubarb is extremely easy to grow, and even the smallest home-owners yard can accommodate rhubarb plants! You will be provided with tasty, versatile rhubarb to create many amazing rhubarb dishes including breakfast, lunch, and dinner! Rhubarb plants need very little care and attention and they usually do not suffer from diseases and pests. Rhubarb is also grown in "hothouses", making it available almost year round in some localities. Hothouse rhubarb is usually a brighter red variety that is more tender and sweeter tasting than cultivated rhubarb. In warm climates, rhubarb will generally grow year-round. In areas with freezing winter temperatures, the above ground portion of the plant dies. At the return of warm spring weather, the plant grows again from the root. Rhubarb can be "forced" to grow, outdoor, and indoor forcing of rhubarb is possible. Different varieties of rhubarb produce different shades of red to pink to greenish rhubarb stalks, however all are equally suitable for eating. Most commonly rhubarb is cooked, stewed, or baked into pies, breads, muffins, cakes, and other scrumptious desserts. In many recipes, rhubarb is often combined with another fruit, such as raspberries, strawberries, blueberries or peaches. When combined with other fruits, rhubarb needs less actual sugar to take away the tartness. Rhubarb is also commonly made into amazing rhubarb jams, rhubarb jellies, and punch and smoothie rhubarb drinks. Rhubarb can be preserved by freezing rhubarb or by canning rhubarb. Since rhubarb is actually a vegetable it is no surprise that many amazing rhubarb dinner recipes exist, of which rhubarb chili is my favourite! Other supper recipes for rhubarb include: Fish Rhubarb Dinners, Beef Rhubarb Dinners, Pork Rhubarb Dinners, Chicken Rhubarb Dinners, and Lamb Rhubarb Dinners. Rhubarb can also be used to make rhubarb wine. Rhubarb leaves can be used to make an natural insecticide. Fresh picked rhubarb (leaves removed) will stay fresh in the refrigerator for 3 - 5 days. When cooking with rhubarb, it is best to use "non-reactive" cookware that does not react with the acid in the rhubarb. Teflon or stainless-steel cookware is preferable over aluminum and copper. Cooking rhubarb in aluminum or copper may cause "stains" on the pans. Rhubarb is one of the only two vegetables that grows continues to grow, and propagate unlike other vegetables that need to be sown each year. The other perennial vegetable is asparagus. Wild Rhubarb is not to be confused with garden varieties of rhubarb. Wild Rhubarb is another name for Common burdock, a weed which looks somewhat similar to rhubarb in appearance, but is not edible.